Nancy Poydar grew up in eastern Massachusetts. After earning degrees in English and education from Tufts University, Nancy studied art at the DeCordova Museum in Lincoln, Massachusetts, and the Boston Museum School. 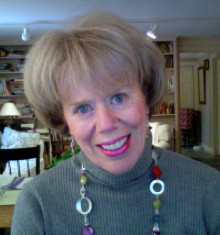 She taught sixth grade for fourteen years in Concord, Massachusetts. Nancy always used illustrated books heavily in her reading programs, encouraging her students to use drawings and other art work to illustrate their own book reviews and projects. She encouraged her students to think of themselves as authors, illustrators, and critics as well as readers. Classroom visits from authors and illustrators inspired Nancy to try working in the children’s book field herself. After developing an illustrator’s portfolio, she left teaching to illustrate and eventually write full time. Nancy draws her ideas from motherhood, the classroom, and especially, from her own childhood.